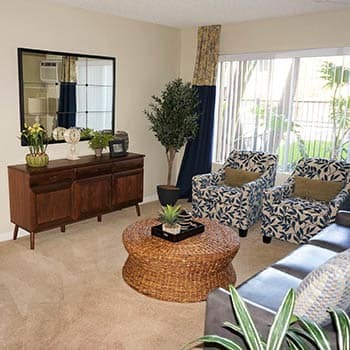 At UCE Apartment Homes, we offer spacious floor plans to suit your busy California lifestyle. 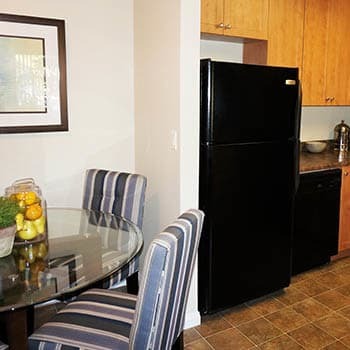 Stream, our one bedroom layout, measures 600 square feet, while Brook, our two bedroom apartment, measures 800 square feet. All floor plans are designed for easy living. Well-equipped kitchens feature faux granite countertops, new cabinetry, and full-size appliances. Hardwood floors make a clean impression. There’s plenty of space to relax on your own or spend time with friends. *Pricing is based on select units and is subject to change. Availability and qualification standards may also affect rents noted herein. Members of the UCE Apartment Homes community have total access to resort-style amenities including a pristine pool, outdoor table tennis, bocce court, putting green, and open-air lounge with fire pit. Be productive in the business and media centers. Stay in shape in our state-of-the-art fitness center, or just perfect your game on the billiards table. The details are taken care of with on-site management and 24-hour emergency maintenance. Our convenient location makes your southern California commute a snap. You are free to concentrate on school, work, and the things that matter to you. Come take a walk through our palm-lined grounds, and discover the pleasures of amenity-rich apartment living. Explore the possibilities of exceptional student living. Reach out to our leasing office to schedule a time to visit UCE one and two bedroom apartments for rent in Fullerton, CA, today.